NBC Chicago and Ward Room bring you profiles on the 18 wards heading into a runoff election April 7. 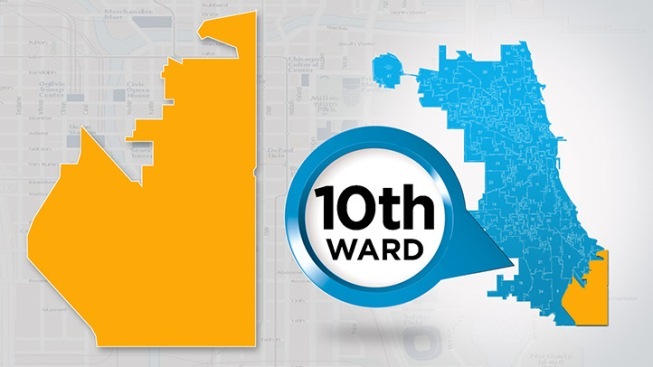 In this profile, learn all about the 10th Ward. Olivia Hernandez, executive director of South Chicago-serving and Latina-led grassroots community organization Centro Comunitario Juan Diego, says that environment, jobs and violence are issues the community are most concerned with. Because there are a number of factories located in the 10th Ward, the community is concerned with pulmonary diseases. In addition, there is concern for the lack of jobs especially for youth. Hernandez says she is unsure of voter turnout for the runoff because of not knowing how people feel about any of the candidates. Yolanda DeAnda, executive director of the East Side Chamber of Commerce, agrees that the community is concerned with the lack of jobs in addition to small businesses and quality education. In terms of what the mayoral candidates have to offer, DeAnda says, “I believe Rahm Emanuel is an intelligent man and can bring these [concerns] to the table to begin to resolve these needs. He does not show enough emotion for the public to believe he is sincere in helping all citizens. Jesus Garcia, on the other hand, is a people person and has the charisma to court the public. But can he handle the business of running our city? Can he surround himself with the experts that are needed to turn Chicago to move forward? To me, the fact that he has held many offices makes me wonder why.” DeAnda also thinks that there may be a “little more” voters turning out for the runoff because of competition and two types of voters: ones that believe that voting is a duty and obligation, and ones that are loyal to their candidate. How did they vote in the mayor’s race? Adjectives that Describe the Ward: Toxic, working class, forgotten, closely-knit. South Deering residents refer to their community as “Slag Valley” due to the industrial waste. How Ward Typically Votes: John Pope was first elected in 1999. In 2007, he won 70 percent of the vote, defeating Dinah Ramirez (19 percent) and Thomas Malesh (11 percent). In 2011, Pope won 59 percent of the vote, defeating Richard Martinez (36 percent), Joe Nasella (4 percent) and Jose Leon (1 percent).